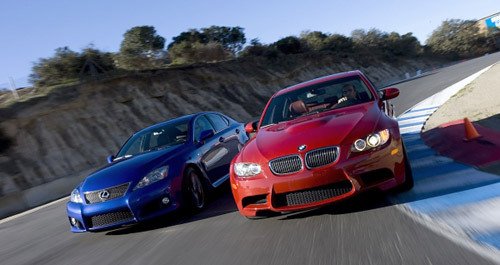 When I saw that Car & Driver was running a comparison test between the BMW M3 sedan and the Lexus IS-F, I knew it was a forgone conclusion, the BMW was going to come out on top. After all, the 3-series, which the M3 is based on, has been a fixture on C&D’s 10Best list for seventeen straight years, meaning a lot of the subjective elements of the comparison were going to fall in BMW’s favor. On the racetrack, we worked the IS F’s manumatic transmission to keep the engine above 3800 rpm, which was satisfying and painless. Toggling the right-side aluminum steering-wheel paddle produces a kick-in-the-crotch shift that’s quicker than we could ever achieve with hand and foot. Downshifts are actuated via the left paddle, and the computer blips the throttle for a racy, seamless feel. The gear lever can be set to shift itself, and we rated this automatic on par with the M3’s manual unit, which is the first time we can remember heaping such praise on a slushbox. It’s that good. It’s hard to argue with what this powertrain can produce. It brushes past 60 mph in 4.4 seconds, clears the quarter in 12.8 seconds at 114 mph, and runs briskly to a governed top speed of 172 mph. That’s Porsche 911 territory. Still, final score: M3 233, IS-F 219. 6 of the 14 points separating the IS-F from the BMW fell under the hard-to-quantify Gotta Have It and Fun to Drive categories, with the remaining 8 points split among the rear seating, exterior styling and little differences here and there.